On P3A-194, SG-1 encounters the Volians, a peaceful agrarian society, who introduce them to the advanced and benevolent race with whom they share membership in an interplanetary confederation, a race which is possibly a formidable ally against the Goa'uld. They are the Aschen. The Aschen are anxious to share their technology in exchange for full disclosure of the stargate network, and negotiations begin between Mollem of the Aschen, and Ambassador Joseph Faxon. Meanwhile, the SGC is troubled to discover that the Aschen homeworld may be in the vicinity of P4C-970, the planet named in the mysterious message that was a warning from the future. The trade negotiations proceed so smoothly that O'Neill becomes suspicious of the Aschen agenda. Meanwhile, Daniel and Teal'c explore the planet and discover the remains of a buried city, once a flourishing urban community. Daniel is able to partially translate newspapers found there, and learns that the Volians were once a thriving urban civilization. When a flu pandemic killed millions, the Aschen arrived and offered a vaccine that saved their world. They were seen as heroes until it was discovered that the vaccine had a side effect. The urban society abruptly ended, all evidence was buried, and the past was forgotten. O'Neill tries to warn the President against an alliance, but he is thwarted by Senator Kinsey, who takes the negotiations out of his hands. Faxon and Carter return to the planet, and under the pretense of requesting a translation, they learn the sinister truth behind the newspaper headline: "Vaccine Causes Sterility." The negotiations have been an Aschen ploy to wipe out humanity. 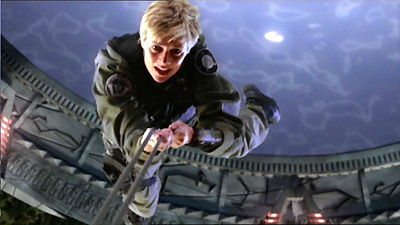 Furious at being discovered, the Aschen prepare to send a bio-weapon to Earth, but Carter escapes through the gate in time to give warning and close the iris. The Aschen's only victory is the acquisition of coordinates to a black hole. Aschen technology includes medical advances that extend the lifespan and eliminate disease, transporters, floating harvesters, the ability to create a secondary star by igniting a gas giant, and bio-weapons containing living radioactive genetic material designed to attack and destroy only the specific DNA of the enemy. They seek new planets to colonize, but their ships travel only within the Aschen Confederation, and their stargate had been found buried, with no DHD and no gate addresses. They were willing to share their technology and membership in the Aschen Confederation in exchange for stargate technology. The DHD is designed to automatically compensate for stellar drift. Carter theorized that the outside limit for a lock between two stargates without a DHD is 300 light years. The search for the Aschen homeworld within that radius of the Volian system revealed four planets, including P4C-970. Two hundred years ago, the Volians were a thriving urban civilization approximating 1900 North America in technological development. Newspaper archives show pictures and a language similar to ancient Celtic texts from Wales. A flu pandemic killed millions, and when the Aschen arrived in ships and offered a vaccine that saved their world, they were seen as heroes. The Volians joined the Aschen Confederation in a friendship that lasted years. When it was discovered that the Aschen vaccine causes sterility, there were riots, the urban society abruptly ended, and all evidence of the society and the capital city was buried. In 200 years P3A-194 went from an urban civilization of millions to a simple agrarian civilization of thousands. The president is under a lot of pressure to present a concrete benefit of the stargate program before the next election. The president decided that the Earth-Aschen treaty is a state matter, pulled the SGC out, and put Kinsey in charge of the next stage of negotiations. The coordinates offered to the Aschen included a black hole. Just when you think you're not in Kansas anymore, it turns out you are. Colonel Starsky... or is it Hutch? I can never remember which one you are.